Where Can I Find Senior Dental Insurance? 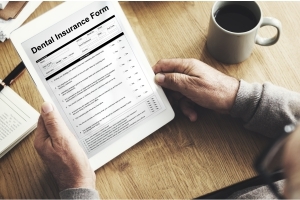 Finding the right senior dental insurance plan can be tricky, especially on a seniors’ fixed income. Luckily, new dental plans for seniors are available that make affording the routine and emergency dental care you need possible. One dental insurance alternative often overlooked by seniors are dental savings plans. This plan option is affordable, cost-effective and will help you receive significant discounts at the dentist time and time again. These dentists are perfect for individuals on a fixed income who are looking for savings at EVERY dental visit, no matter how much work is needed. A few other plan options to consider are some offered by the AARP - AARP Plans A & B and AARP Plan C.
They don't require that you be a member of AARP or any other organization in order to join. They don't have many of the cumbersome restrictions found with the AARP. You don’t have to wait a year if you need a crown or dentures, and there is never an annual maximum cap. For a low monthly fee, your savings can begin right away. Learn more about how a dental savings plan can provide you with inexpensive, superior care for the dental procedures you need. Millions of people over 50 have joined the American Association of Retired Persons (AARP). If you are a member in good standing, you are eligible to sign up for the AARP dental insurance plan administered by Delta Dental. 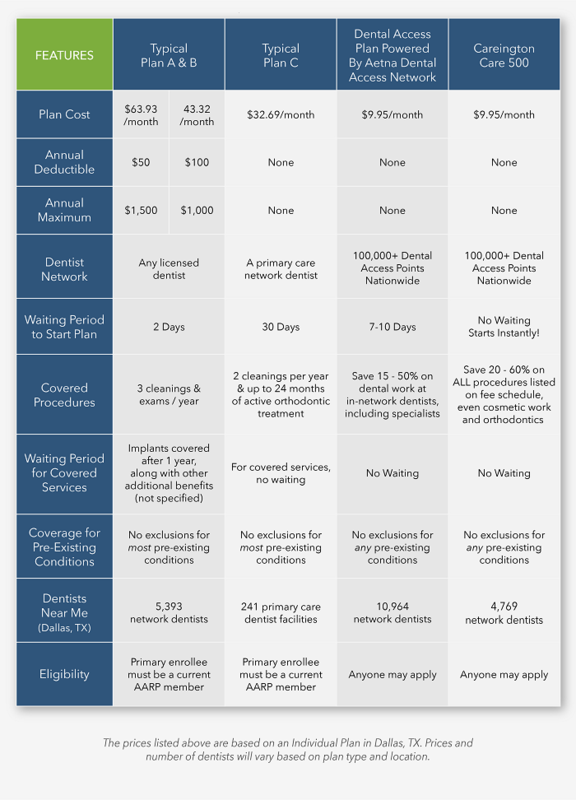 With this plan, you have a choice between two tiers of coverage - Plan A & B or Plan C. See a comparison between these plans and discount dental plans below. Why isn’t Medicare a viable option for seniors? Medicare does not cover routine dental care for adults 65 and over. By law, Medicare is prohibited from paying for cleanings, fillings, crowns, dentures and most other dental work. Although there are a few exceptions, you cannot look to Medicare as a source of senior dental insurance. What Should My Senior Dental Plan Cover? As you're looking for a dental plan to provide you with affordable dental care, consider these common senior dental problems and needed treatments so you know what your plan should cover or discount. Whether you've encountered these dental problems yet or not, finding a dental plan that addresses these treatments is good preparation for what may be to come. Find a Senior Dental Plan Near You! Have more questions about our discount dental plans? Please give us a call at 800-372-7615 or see how much you can save per dental visit using this friendly resource. Tooth Loss May be Linked to Dementia - Do the Elderly Need Dental Insurance for Seniors to Preserve Teeth? Find a Discount Dental Plan Near You! Learn how dental plans work, the cost and how to sign up! Need your wisdom teeth out? Looking for ways to save on dental work? What if I already have insurance?